Voice of SAP is selected to present at the side event during 11th, 3 days Global conference to the CRPD (Convention on the Rights of Persons with Disabilities), attended by 177 member states (countries). This side event is in conference room C at UN Headquarters. Among the confirmed attendees are Secretary of Govt. of India for Department of Empowerment of PwD. 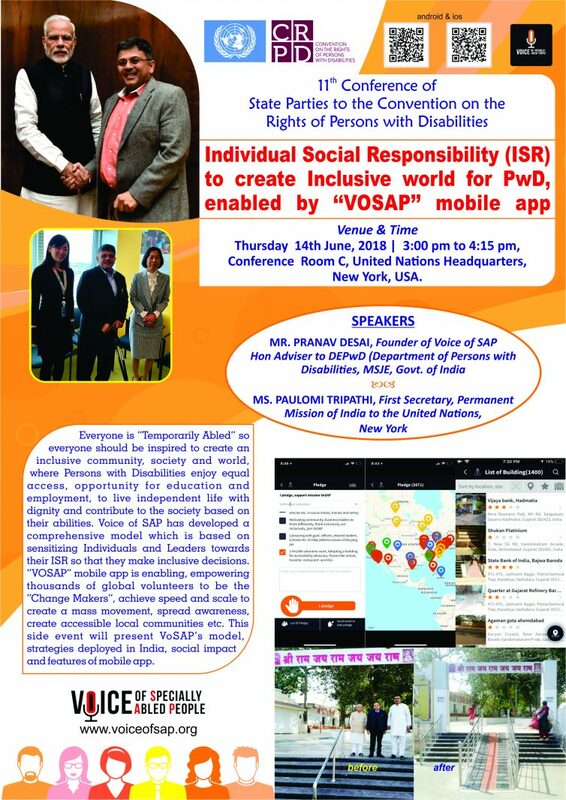 Founder of Voice of SAP, Pranav Desai will speak on the subject of ISR (Individual Social Responsibility), How inspired volunteers can create “Inclusive” world for Persons with Disabilities, in line with this year’s theme of the conference – “Leaving No one Behind”. He will present first hand experience with actual examples, Proof of Concept as executed by VOSAP volunteers in India, under VOSAP model, framework and tools such as global platform of VOSAP mobile application. 1 hour 15 mins side event will include 45 minutes presentation followed by Q&A. To learn more about Voice of SAP, please visit www.voiceofsap.org and listen to 30 minutes interview (podcast) by Editors of India Currents, leading magazine from Silicon Valley for Global Indians.